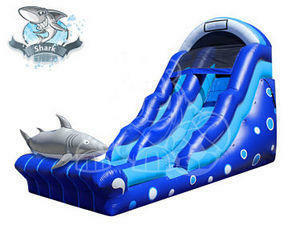 The Shark Water Slide brings excitement and fun to your event! The front load design, allows easy supervision from the front. Your garden hose attaches to the top arch and water mists down the slide for a slippery ride. The catch pool at the bottom ends your ride with a splash! The realistic shark makes for great photo opportunities. They'll be talking about this slide for a long long time!